Despite September’s impressive attempts to imitate our August heat wave, summer is finally over. Autumn has rolled in and schools and universities have resumed business as usual. Here at Westminster Music Library, however, we do not resent the end of summer. The beginning of the school year brings with it thousands of students, and many of them musicians. Did you know that there are five specialist music conservatoires in London alone? Even conservatively estimating an intake of 100 per college per year, that’s 500 new music students in the Greater London area each year – all of whom could benefit from our wonderful collection at Westminster Music Library. We are proud to have the finest public music collection in the country, and are keen to share it with as many musicians as possible. But how do you reach all of these newly-settled musicians? This is where we are immensely thankful for Freshers’ Fairs. 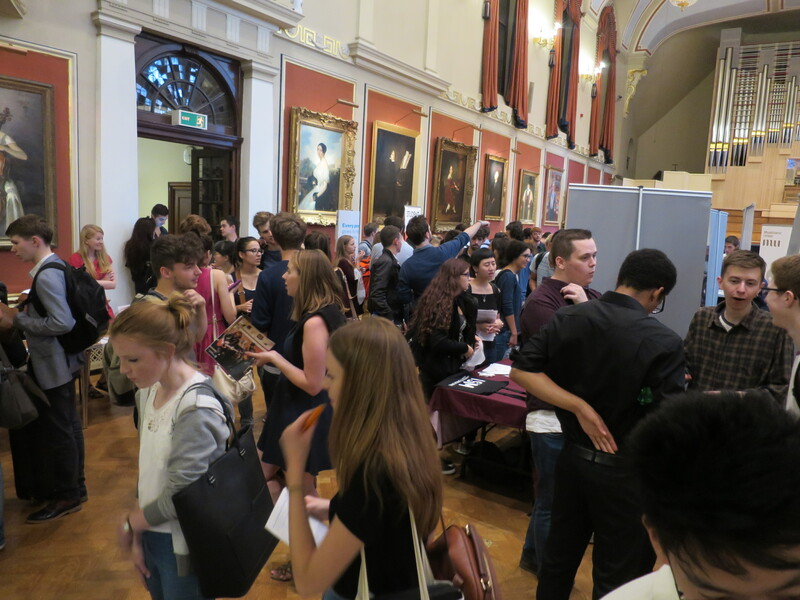 Conservatoires’ Student Unions do a fantastic job arranging these each year for new students to discover what services they could benefit from during their time in London. I was fortunate enough to get to some of these Fairs this year, and meet hundreds of students in the process. I first attended Royal Academy of Music’s Fair, in their very grand concert hall. Over an intense two hours, students flooded in. The amount of foot traffic was amazing and our stall was always surrounded. A large number of students signed up for memberships after learning about our wide selection of stock and generous loan allowances. Being music students, many were particularly interested in Westminster Music Library’s rehearsal room with piano. 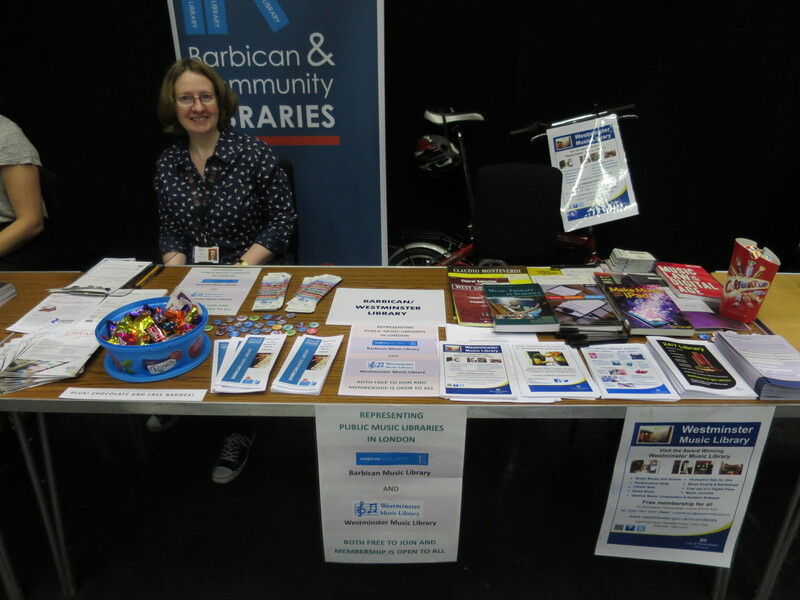 Here I also met our friends from Barbican Music Library, with whom I would be sharing a table at our next Fair. By the end of the Fair, we were exhausted but satisfied with the interest shown. After a few days I was out on the road again, carrying with me sheet music samples, flyers, membership forms, and, most importantly, free chocolates to entice hungry students. I was slightly concerned that my poor little folding bicycle would collapse under the strain on the way to Guildhall School of Music and Drama! Guildhall’s Fair was in their downstairs Theatre, a huge underground space. 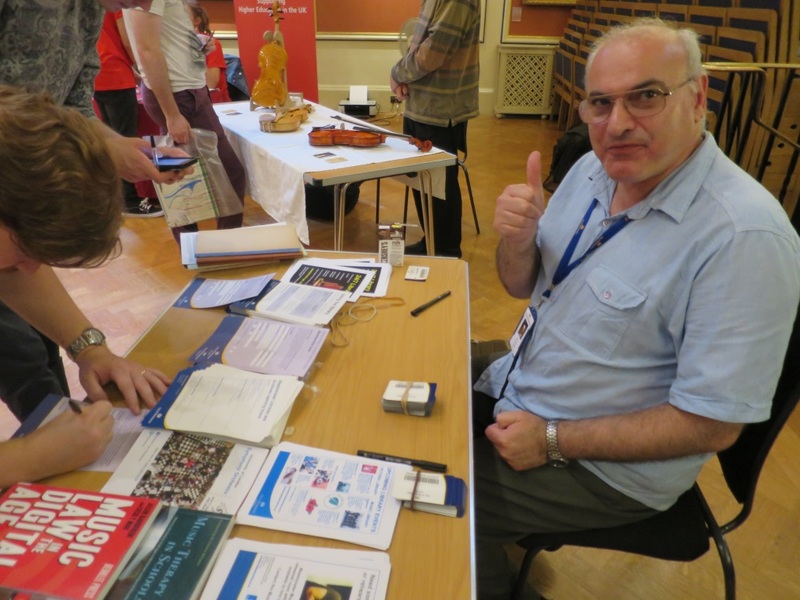 The size of the space allowed many more stallholders to be present, and I particularly enjoyed seeing my friends from Paxman Musical Instruments Ltd., who sold me my French horn many years ago. Other stallholders ranged from the local police force to the Royal British Legion, and even a stall selling second-hand bicycles to new students. Fortunately my bike had survived the journey and I didn’t need to replace it!